Paleo Turkey Sweet Potato Chili is amazing, and this will be a winner for anyone who loves savory sweet potato recipes! And this tasty low-glycemic Paleo chili is also Whole 30, gluten-free, dairy-free, and South Beach Diet Phase Two! Use the Diet-Type Index to find more recipes like this one. I never liked sweet potatoes until I became a food blogger and discovered savory sweet potato recipes. Now I love things like Spicy Sweet Potato Fries, Twice-Baked Sweet Potatoes, and Sweet Potato Gratin, and I always have sweet potatoes in the pantry at my house. One day I was brainstorming recipe ideas with my niece Kara, and she remembered seeing a recipe that used sweet potatoes in chili. We both loved that idea, which led to the Paleo Turkey Sweet Potato Chili you see here. We experimented with ingredients and loved the slightly-spicy turkey chili we came up with. Later when I edited the photos of our Paleo Turkey Sweet Potato Chili, I googled my proposed recipe title and realized there were quite a few recipes out there for chili with sweet potatoes! Luckily it seems like every blogger has a slightly different take on this combination; check after my recipe to see some other blogs that like the idea of sweet potatoes with chili as much as we did! This chili is easy enough to make on a work night, although it benefits from an hour of simmering once you’ve added all the ingredients. Brown the turkey and put in the soup pot; then saute the chopped green pepper, chopped onion, and spices in the same pan. Put that mixture in the soup pot along with the petite diced tomatoes, tomato sauce, chicken stock, canned green chiles, and Green Tabasco. Start to simmer the chili on low while you chop up the sweet potato. Add sweet potato to the chili and simmer on low for an hour, adding a little water if it gets too thick. Season Paleo Turkey Sweet Potato Chili to taste with Green Tabasco Sauce, salt, and pepper; then serve hot and enjoy! And if you’re not Paleo this is amazing with a squeeze of sour cream on top. This Paleo Turkey Sweet Potato Chili is amazing, and this will be a winner for anyone who loves savory sweet potato recipes! Put the browned turkey into a medium-sized soup pot. Add the other teaspoon of olive oil to the frying pan, add the chopped green pepper and chopped onion, and saute about 3-4 minutes over medium heat. Add the minced garlic, Spike Seasoning (if using), chili powder, Ancho chile powder, and ground cumin and cook 1-2 minutes. Add the pepper-onion-spices mixture to the soup pot, rinsing out the pan with a little water. Then add the diced green chiles with juice, petite diced tomatoes, tomato sauce, and homemade beef or chicken stock to the soup pot and start to simmer the chili on low. While the chili simmers, peel the sweet potatoes and dice into pieces about 3/4 – 1 inches square. Add sweet potatoes to the chili and simmer about an hour, adding a little water if it gets too thick. Taste for seasoning and add Green Tabasco Sauce, salt, and fresh ground pepper to taste. This will keep in the fridge for about a week or can be frozen. Recipe created by Kalyn and Kara. 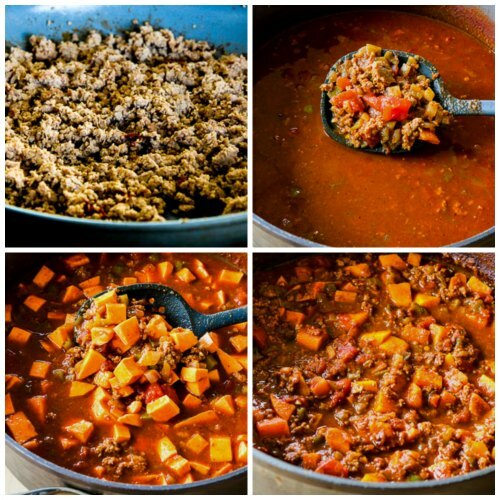 If made with lean ground turkey, this Paleo Turkey Sweet Potato Chili would be approved for phase 2 or 3 of the South Beach Diet and is also Paleo. 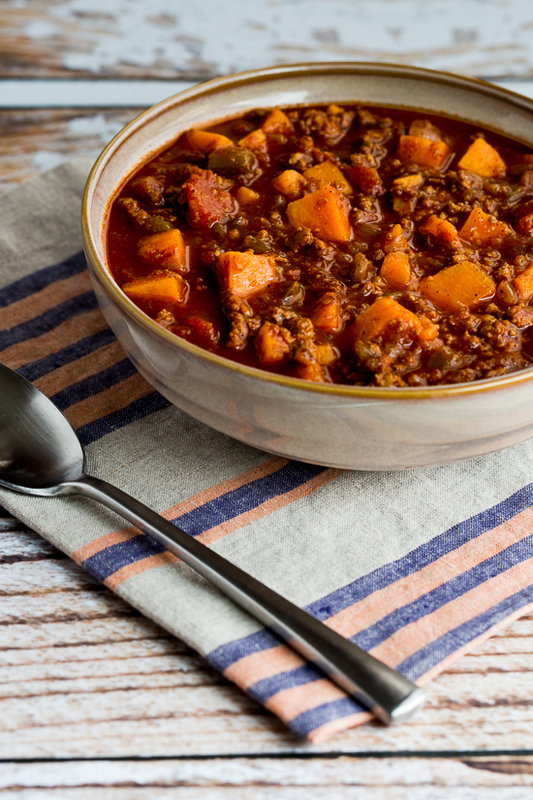 Chili with sweet potatoes is probably too high in carbs for traditional low-carb diet plans. I wasn’t sure about this one, but it was really tasty! Both hubby and I enjoyed! So glad to hear that; thanks for telling me! This was absolutely delicious. I'm a good recipe reader and was eyeing another. I thought, no, I gotta try this one. So glad I did! I don't think I'll ever look at another one again. Thank you, thank you!! One reason I don't want to try to calculate nutritional information is I'm not really sure how much the average person will eat, and I am certainly not trying to tell people how much of something they should eat. In estimating this to be about six servings, I don't measure out the servings, but I'd say it's probably slightly more than a cup. I made this before on the stove and it was amazing! Do you think i can make this in a slow cooker? I'm sure it will work in the slow cooker, although I have done it that way so I can't give you an exact recipe. I would definitely reduce the amount of beef stock, maybe by about half. I might use a little more sweet potato for the slow cooker too. Hey, so I know this post is old, but I LOVE your napkins. Where are they from? Adrienne, I am pretty sure they were from Williams-Sonoma. I have the same one with kind of yellow-green with the gray. Tried this recipe tonight. It was delicious. Even my boyfriend, who has liked very few of the paleo recipes I've tried and doesn't like chili at all, LOVED it and went for seconds! I made slight modifications. Ground lamb instead of Turkey, added parsnips during the simmer stage, and baby spinach at the end just until withered. It was so yummy and there's plenty leftovers to carry for work lunches! Glad you liked it. I like the idea of lamb in this. For the probably well-meaning person who left a link to a chili contest sponsored by a company that makes beans, I'm pretty sure a bean-free chili is not going to win! And I don't let people post link in the comments; it leads to links to things I don't want to promote. Thanks for the very kind feedback Rick, so glad you enjoyed it! This was fantastic and I say that as someone who makes a lot of different chili recipes. I think this will become my new go-to chili recipe. The only thing I did differently was I added a splash of liquid smoke and some hickory-smoked sea salt, which added just a little more depth. But thank you so much…this is a keeper! This was fantastic! I did modify slightly I am incapable of following a recipe, it seems) to cut down the heat (husband is highly intolerable of spiciness). Then I used it for the chili part of I Breath I'm Hungry's Cheesy Chili Spaghetti Squash (http://www.ibreatheimhungry.com/2013/12/cheesy-chili-spaghetti-squash-casserole-low-carb-gluten-free.html), and that took it to new levels of wonderful. Thanks for a great recipe! I'm incapable of following a recipe as well! Fun hearing how you adapted it. I love sweet potatoes and I definitely love this chili! Thanks Medeja; hope you enjoy! I love using sweet potatoes in chili, especially when there's a spicy kick to it! I've never been a fan of the sweet recipes that use brown sugar or maple syrup — or marshmallows. Lydia, I am 100% in agreement with you on that!